This week we start a new chapter in the book: cakes! This will be a challenging subject, although very delicious, I'm sure. 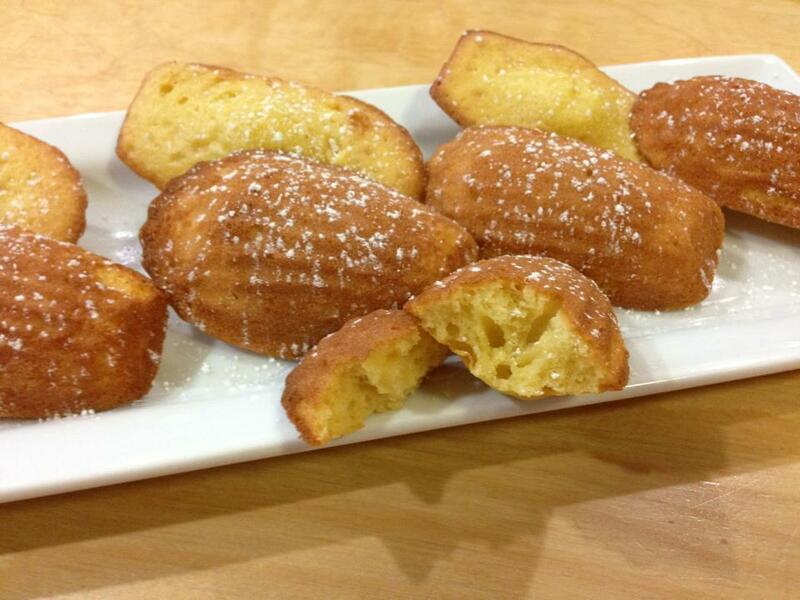 We start off with a fairly simple cake, madeleines. These are small, shell-shaped cakes that are best enjoyed with a cup of tea or cappuccino. The cake batter is a sponge, or genoise batter, very light and airy. The book offers a traditional and a pistachio version. Everyone enjoyed making (and eating) these tiny treats. Also, it seems we are not the only ones inspired to bake through the book, as our guest baker this week is doing the same! I have eaten many madeleines and except for one that I had in Paris, they're always dry and dense. It is true they taste best the first day, actually even a few minutes after they come out of the oven. When I bit into the madeleine, it was so moist and the pistachio flavor came through, not very strong but I didn't think it needed to be. I have to say I am most proud of the humps which is the reason for my particular photo selection. I have never been able to get the madeleines to rise. With this recipe, at the 7-minute mark, 4 of the madeleines had humps and the rest were still a little wet-looking so I let them go for another 2 minutes and by then they were perfect. Along with the pistachio madeleines, I also made the traditional version. These did not get quite the same height as the bumps as the pistachio ones unfortunately. That is more of a visual preference though. Dusted with a bit of powdered sugar on the ridged side and they look beautiful. I am so happy to start the cake chapter! Cakes are my favorite thing to bake. I love madeleines and was excited for this recipe. Once again, we must make the batter and chill overnight. No problem, we're all used to that by now. The batter was easy to make, only took a few minutes. I added vanilla to mine, to give more depth of flavor, and because I love vanilla! The next day when I went to bake them, I spooned the batter into a plastic baggie and snipped off the corner to make a simple piping bag. The batter was so spongy and full of little air pockets, it looked almost like a space-aged foam! But delicious, of course. They were so spongy and airy, tiny little delicious cakes! They aren't too sweet, really easy to make, and a great crowd-pleaser. Another winning recipe! By the time we reached baking scones, I realized that making one batch was not going to be sufficient. I want my family enjoy what I am baking and have my co-workers enjoy tasting our bake of the week. Unfortunately, there is never enough to go around for everyone. The bakes are so delicious that sometimes co-workers have someones else's share and I really can't blame them as everything we have baked is out of this world. I am now baking four batches of everything I do. It also helps to practice, practice, practice. I was excited to use my new Williams-Sonoma Goldtouch Nonstick madeleine pan! I made the madeleine batter and refrigerated it over night as required and froze the buttered pan. It was nice to have them only bake for about 7-8 minutes. They came out perfect! 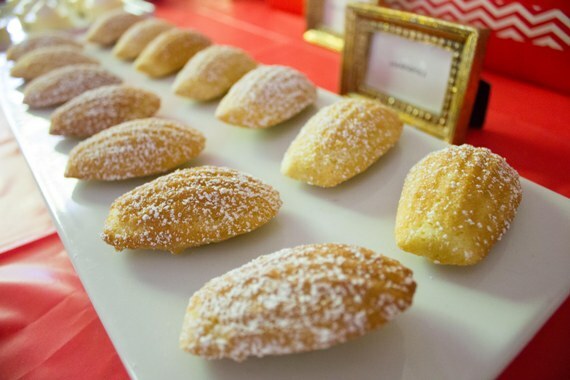 These are the best madeleines I have ever tasted. They were moist and had a nice spongy texture to them. They not dry and hard like others I have tasted in the past. I used 2 drops of lemon oil and what a difference the small amount made. The lemon was really present. I'm making these again! This week we have another guest baker. Welcome Julie! Her review of the madeleine recipe is paraphrased from her blog; the link is below. The batter came together pretty easily. I love watching ingredients transform. The beaten eggs and sugar all emulsify together and double in size. Science. I've come to expect now that I have to refrigerate everything overnight. This batter was no exception so it went into a plastic container and got chilly. Int he morning, the batter had these cool air pockets inside of it from the leavening starting to work. More science. These little buddies baked up so cute. I'm a big fan of things in miniature (or giant) so these are right up my alley. They really do taste like yellow cake... if only I had some chocolate icing to put on them. I love Madeleines! As you can see I own 3 different type of pans, the traditional mini pan from France, a non-stick pan from Sur La Table and my latest addition, a 'Fat Daddio' pan with 16 cavities. The only pan I passed over was a silicon mold. I should have followed Letitica and triple the batches just so I could test out the recipe by baking them in all 3 pans. For this time I used the Fat Daddio pan with 16 cavities. The recipe and techniques were pretty easy to follow for a basic butter cake. Only adjustments to the recipe, I reduced the granulated sugar to 50g and replaced the drops of lemon oil with lemon zest from one lemon. I used a small portion scoop and was able to get 16 Madeleines from one batch. The trick is not to overfill, the batter will more than double. I baked the tray in a preheated 350F oven for 5 minutes, then turned on the convection for the last 3 minutes to get the bubble in the middle. Taste wise, my family said it was the best recipe out of the 3 Madeleine recipes we had tried. They say, all the recipes we had tried out of The Bouchon Bakery cookbook has been excellent. I actually made my own pistachio paste and though the consistency wasn't perfect it did the job of adding that nice nutty flavor and it was much cheaper. Hello, I love Madeleines too. I started trying different recipes few days ago, I'm looking for a pretty dense one.I didn't get a chance to try a fresh madeleine when I was in Paris last month, just bought a bag from supermarket instead. But they were were delicious and its a dense one. Just wondering have you got a recipe which for dense ones please? Hope that is what you're looking for!